Have you ever seen a black carrot? That is a picture of black carrots grown in the fields in Okinawa, Japan. Black carrots originate from Afghanistan, Turkey, and surrounding countries. It is difficult to find this particular vegetable in many countries. The black carrot is often used as a natural dye agent but not commonly seen in food products or other consumable goods in the western world. 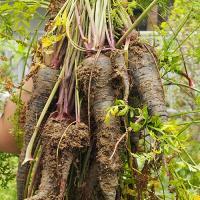 It is called a black carrot, however, it is a blend of a dark purple rather than a completely black color. 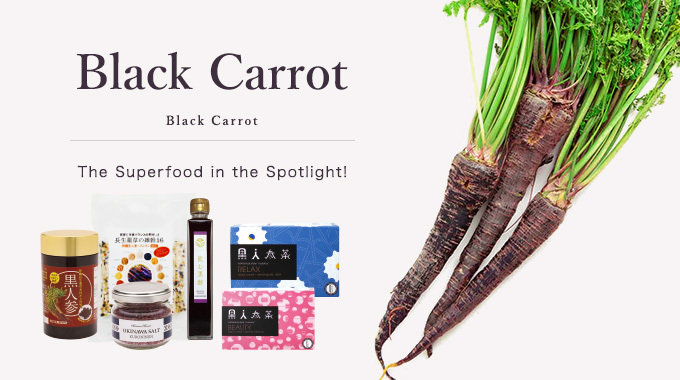 In Japan, the black carrot is now being cultivated as it has been realized to have positive effects on human health. they can help fight against cardiovascular disease, cancer, asthma, diabetes, etc. We need to realize that the western diet is not helping us, just holding us back. The Japanese know the importance of getting enough minerals and vitamins in their diet. They believe in blending a variety of plants to enhance taste and health benefits. They are promoting and adding it to many health goods which have made their way to many Japanese people’s homes. The Japanese diet is ever-changing, but by no means slowing them down. 下地, 清吉. 琉球薬草誌. 1st ed. 沖縄県: 琉球書房, 2015. Print. -Akazome Y. Characteristics and physiological functions of polyphenols from apples. Biofactors. 2004;22(1-4):311-4. -Akiyama H, Sakushima J, Taniuchi S, et al. Antiallergic effect of apple polyphenols on the allergic model mouse. Biol Pharm Bull. 2000 Nov;23(11):1370-3. -Boyer J, Liu RH. Apple phytochemicals and their health benefits. Nutr J. 2004 May 12;35. -Enomoto T, Nagasako-Akazome Y, Kanda T, Ikeda M, Dake Y. Clinical effects of apply polyphenols on persistent allergic rhinitis: A randomized double-blind placebo-controlled parallel arm study. J Investig Allergol Clin Immunol. 2006;16(5):283-9. -Gajewski, Marek, et al. “Some aspects of nutritive and biological value of carrot cultivars with orange, yellow and purple-coloured roots.” Vegetable crops research bulletin 67 (2007): 149-161. -Kanda T, Akiyama H, Yanagida A, et al. Inhibitory effects of apple polyphenol on induced histamine release from RBL-2H3 cells and rat mast cells. Biosci Biotechnol Biochem. 1998 Jul;62(7):1284-9. -Kojima T, Akiyama H, Sasai M, et al. Anti-allergic effect of apple polyphenol on patients with atopic dermatitis: A pilot study. Allergol Int. 2000:49(1):69-73. -Nicolle, Catherine, et al. “Genetic variability influences carotenoid, vitamin, phenolic, and mineral content in white, yellow, purple, orange, and dark-orange carrot cultivars.” Journal of the American Society for Horticultural Science 129.4 (2004): 523-529. -Puel C, Quintin A, Mathey J, et al. Prevention of bone loss by phloridzin, an apple polyphenol, in ovariectomized rats under inflammation conditions. Calcif Tissue Int. 2005 Nov;77(5):311-8. -Schaefer S, Baum M, Eisenbrand G, Janzowski C. Modulation of oxidative cell damage by reconstituted mixtures of phenolic apple juice extracts in human colon cell lines. Mol Nutr Food Res. 2006 Apr;50(4-5):413-7. -Tokura T, Nakano N, Ito T, et al. Inhibitory effect of polyphenol-enriched apple extracts on mast cell degranulation in vitro targeting the binding between IgE and FcepsilonRI. Biosci Biotechnol Biochem. 2005 Oct;69(10):1974-7. * The statements contained herein have not been evaluated by the Food and Drug Administration. The information contained in this website is intended for education, entertainment and information purposes only. This information is not intended to be used to diagnose, prescribe or replace proper medical care. The plant described herein is not intended to treat, cure, diagnose, mitigate or prevent any disease.